Cali'Flour Foods has helped millions transform splurge foods into superfoods. 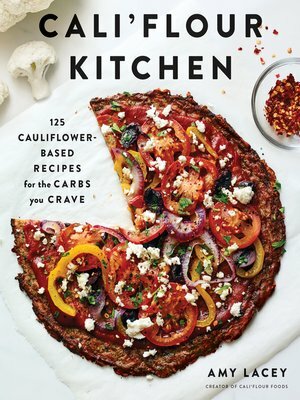 And now, their first cookbook, Cali'Flour Kitchen, offers recipes for the dishes you haven't been able to enjoy for years—from French Onion Soup and Quiche Lorraine to pizza, cookies, enchiladas, and lasagna. Cali'Flour Kitchen is designed for people across the dietary spectrum, providing perfect, guilt-free recipes for every carb-heavy craving, whether you're eating vegan, dairy-free, keto, paleo, or a plant-based diet. For those suffering from health issues like diabetes and autoimmune diseases, this cookbook reintroduces those favorites that have long been forsaken, reinventing them to include a full serving of vegetables. With more than recipes and detailed how-tos on creating cauliflower crusts, rice, crisps, wraps, and zoodles, Cali'Flour Kitchen is all about indulging without compromising health. Amy's Cali'flour products have won numerous awards, have been featured in Food & Beverage Magazine,GQ, and OK! magazine and as one of "Whoopi's Favorite Things" on The View. Cali'flour is a two-time Clean Eating magazine award winner.